Connect power and Gigabit Ethernet data to 8 PoE-enabled devices, with 30W per-port output - Wall Mountable - The IES81000POE 8-Port Gigabit Power over Ethernet Switch lets you connect Gigabit Ethernet and power to up to eight PoE-enabled devices, or a mixture of PoE and non-PoE components. Giving you the freedom to place your equipment in locations where power outlets are not available, this PoE+ switch complies with IEEE 802.3af and 802.3at standards and supplies up to 30 W per port, with a total power budget of 120 W. A true unmanaged switching solution, the 8 PSE (Power Sourcing Equipment) ports sense whether the connected devices are PoE-ready or require data connectivity only, and also auto-negotiate between 10/100/1000 Mbps network speed and duplex. 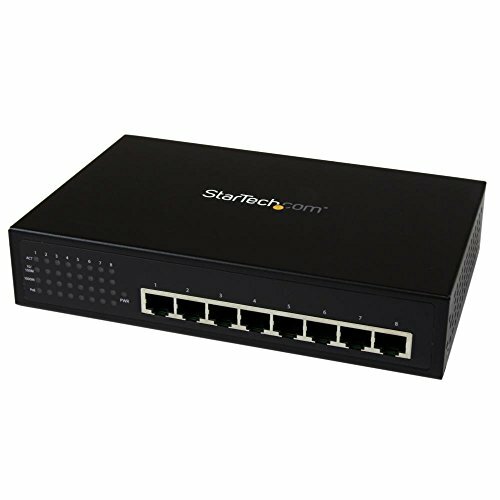 The Gigabit Ethernet switch features a sturdy, wall-mountable metal enclosure for durability, and front panel LEDs for quick indication of connection speed and status. Backed by a StarTech.com 2-year warranty and free lifetime technical support.